Millions of people in the world today are hungry because they live in poverty. That number will likely increase as climate change further threatens the food security and livelihoods of subsistence farmers and the most vulnerable populations. According to the Food and Agricultural Organization (FAO), the world currently produces enough food for everyone. The challenge, however, is in overcoming inequality caused by lack of access, poor agricultural management practices, declining water resources, changing weather patterns and a lack of knowledge about potential adaptive measures. 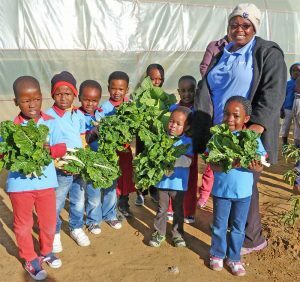 Through its Adaptive Agriculture Program, INMED Partnerships for Children is dedicated to establishing sustainable food programs that improve food security, conserve natural resources, promote strategies for adapting to climate change and provide opportunities for income generation. At the heart of INMED’s Adaptive Agriculture Program is aquaponics, a combination of hydroponics and fish farming in a closed system that produces year-round crops at 10 times the yield of traditional farming while conserving scarce water resources and energy. INMED has developed a simple and affordable aquaponic system for small-scale farmers, schools, government institutions and even home gardeners that uses easily accessible “off the shelf” local materials. Its modular design and limited mechanization make this system easy to operate and maintain and does not require fertilizers, chemicals or heavy labor.